What is the IT Band? 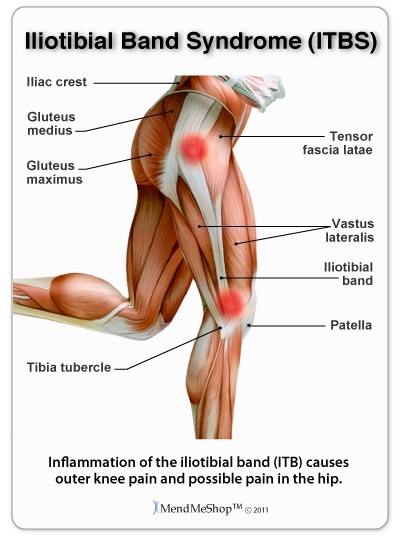 The IT Band is thick cord-like band of tissue that runs down the outside of the thigh. It starts at the hip and attaches just below the outside of the knee. The IT band helps provide stability to the hip and knee joints. IT band syndrome is a common term for pain/tightness on the outside portion of the hip, thigh or knee. It is very common in runners because every time the knee or hip is bent, the IT band rubs on bone and can become irritated if overstressed from extensive training. What can I do to prevent IT Band Syndrome? One of the best prevention tools is stretching. Stretching the hip and knee will help decrease stress on the IT band. Also, ensure that you are wearing properly fitted, supportive shoes to absorb the impact of running. As with any condition, if you start feeling pain, don't "push through" to finish your workout; stop exercising, rest and relieve the pain. Symptoms of IT Band Syndrome: Pain is the most common symptom of IT band syndrome. The pain can be present either at the hip, the outside of the leg, or on the outside of the knee. The pain is typically very intense with activity, especially the longer activity goes, but is relieved with rest and stretching. Some people may also notice a "snapping" feeling on the outside of the hip. This is because the IT band "snaps" over the thigh bone as the hip moves. What do I do if I think I have IT Band Syndrome? IT band syndrome is best treated by decreasing the stress on your leg, and increased stretching. It will be necessary to stop training for a while until the leg heals, or at least decrease the distance/intensity of training sessions. Add hip and knee stretching to your daily routine 2-3 times a day to increase flexibility. Fleet Feet has several massaging/stretching tools to help you loosen up the IT band. Applying ice to the painful area for 15 minutes 2-3 times a day as well as taking anti-inflammatory medicine (take as directed on the bottle, and only if you've been told by a physician it is OK for you to take these medications) will also help relieve your pain. Additional information: If these tips don't help relieve your pain, you may need a more thorough evaluation by a physician and other, more personalized treatment options for pain relief.